Our last post, made about a year ago, shared our excitement at having delivered HPF to its permanent home on HET, and recording the instrument’s first data. Since then, we have been busy doing the hard work of “commissioning” the instrument. For an astronomical instrument, commissioning refers to a period of performance verification and fine-tuning that occurs once the instrument arrives at the telescope. Certain tests and adjustments can only be done in conjunction with the telescope, so some patience is required as the instrument team makes improvements before real science can begin. We are happy to report that HPF has now been released to the HET community for full science operations! We have also collected enough data that we can start to evaluate the measurement precision of the spectrograph, and determine whether our on-sky performance matches our original project goals. Here, we will show you some of that data, and explain why we are confident that HPF will break new ground in the study of the nearest exoplanet systems. Technical details of this work can be found in an upcoming edition of Optica. While the ultimate goal of any Doppler spectrograph is to find lots of exoplanets, boring is better during the commissioning phase. The only way to test the stability and precision of your end-to-end measurement system–from the telescope, through the fiber optics, and ultimately the optics and detector of the spectrograph–is to make repeated measurements of a star with little or no variability. That way, any variability seen in the measurements must be caused by the instrument, rather than the star itself. In other words, the less variability we measure in observations of our stable “standard star,” the better the instrument is performing. For the M dwarf stars HPF is designed to target, the best standard star is also one of the most famous stars in the sky. Barnard’s star–named for the American astronomer E. E. Barnard–is the second-closest star system to the Sun (after the alpha Centauri triple system). It is a little more than 14 percent as massive as the Sun, which is typical of the stars HPF will survey for exoplanets. Barnard’s star can be seen moving relative to background stars in this time-lapse image. Barnard’s star has the highest on-sky velocity of any star. (Image courtesy Steve Quirk). Barnard’s star is extremely old–possibly as old as the Milky Way Galaxy itself. As such, it is rotating extremely slowly, and exhibits little of the stellar activity that causes radial velocity variability in other stars. That low variability makes it an excellent commissioning standard for HPF. Furthermore, its location near the celestial equator means it has been observed by telescopes in both the Northern and Southern Hemispheres, so we can compare our results to those of other spectrographs. The Hobby-Eberly Telescope is queue scheduled, meaning resident astronomers record data for multiple users over the course of a single night. This method of scheduling is ideal for repeated observations of a single star over time. 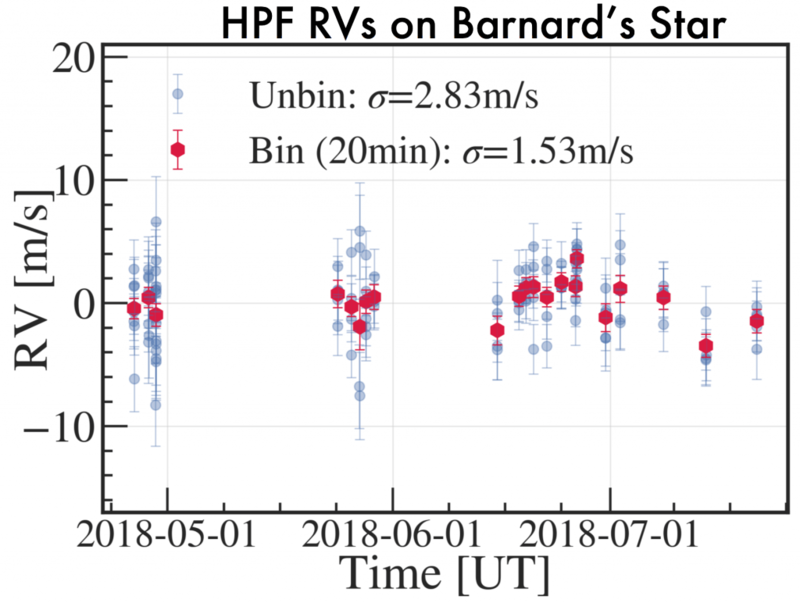 From February through July of 2018, HPF recorded the spectrum of Barnard’s star on every night possible. 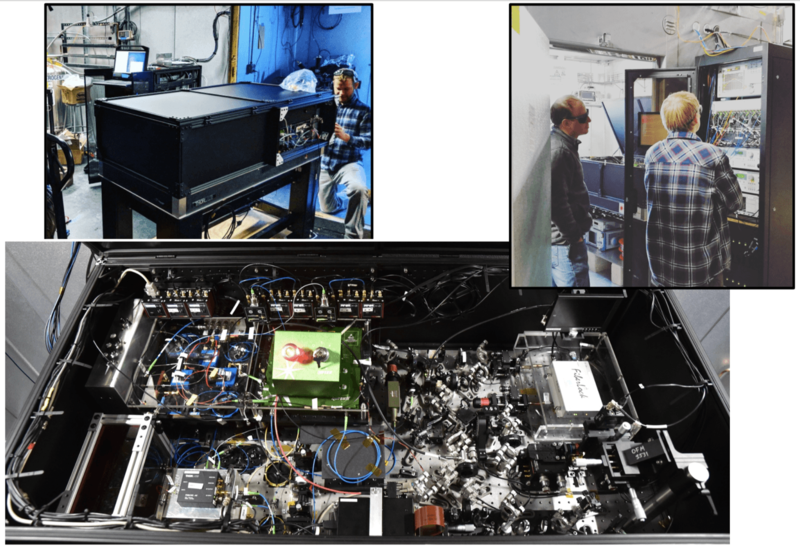 Our HPF observations kicked into high gear in May, when the Laser Frequency Comb (LFC) from our team members at NIST and CU was fully operational at the HET. The LFC is based on Nobel-prize-winning technology, and uses carefully modulated lasers and optics to create a perfectly uniform array of laser lines that can be used to provide an ultra-stable wavelength reference against which HPF measures Doppler shifts in a star’s spectrum. We discuss the LFC in more detail in a companion post. We would be remiss if we did not emphasize that working all of the kinks out of an ultra-precise Doppler spectrograph is a years-long process, and we are far from done making improvements to the instrument and our analysis techniques. With that said, our early observations of Barnard’s star are extremely promising! HPF radial velocities of Barnard’s star. Blue points represent individual spectra, while red points are the average of measurements made within a 20-minute series. The 1.5 meter per second precision is the best ever achieved in the near infrared! Our current data series on Barnard’s star show a stability of around 1.5 meters per second, which is the best ever demonstrated on an infrared instrument. For comparison, the most stable measurements of Barnard’s star ever reported come from the HARPS spectrograph, and they check in at around 1.2 meters per second. Until now, HARPS has been the industry standard in ultra-precise Doppler spectroscopy, so for HPF–with its newer and more complicated infrared technology– to nearly match HARPS so soon after going on sky is a major accomplishment! Long-time readers of this blog may recall that our goal measurement precision is 1 meter per second, while our current precision appears to be around 1.5 meters per second. What noise sources might be remaining? It is probably a combination of stellar activity, contamination from Earth’s atmosphere, small exoplanets, and some yet-to-be identified instrumental systematics. We are continuing to check everything in an effort to squeeze every last drop of precision out of HPF. A Planet Around Barnard’s Star? Just after we finished our commissioning observations on Barnard’s star, the Red Dots team announced they had discovered a candidate exoplanet orbiting Barnard’s star. The proposed planet, Barnard b, is around 3 times the mass of the Earth and takes 233 days to complete an orbit, so its Doppler signal is quite small. Nevertheless, HPF’s precision is good enough to at least see some trace of this planet, so what gives? As it turns out, cosmic coincidence prevents us from having much information on Barnard b at this point. The orbit of the proposed planet is eccentric, which means the Doppler signal is more pronounced at some phases of its orbit than others. Through nothing but luck, our HPF-LFC observations completely missed the most dynamic section of the Barnard b phase curve. The orbital model of Barnard b (blue), with HPF measurements (gold) folded to the orbital phase. Our measurements have not yet covered the maximum of the eccentric orbit. Thus, while our HPF measurements do not rule out the proposed planet, they cannot yet confirm it, either. This is just one of many examples of how exoplanet detection is a data-intensive process! HPF’s first year on sky is in the books, and things are looking quite promising! We are already setting new records for Doppler precision in the near-infrared, and continue to push towards even better stability. Now, the fun part begins. HPF science operations officially started on December 1, 2018. Whereas Barnard’s star is one of the most familiar, well-studied stars in the sky, we will now expand our operations to examine stars about which relatively little is known. As always, we will share any exciting new results with you here. We will continue to observe Barnard’s star, both to validate our long-term instrumental performance, and to learn more about any planets that may orbit this ancient star. It is as quiet as stars come, but it may still be harboring some exciting secrets. After beginning operations earlier this year, HPF continues to patiently watch for the subtle Doppler shifting of stellar spectra that hints at the back-and-forth tug of orbiting exoplanets. As described in previous blog posts, HPF records spectra on a detector array (similarly to how a digital camera records an image), and the shifts we seek amount to microscopic motions of the spectra back and forth by just a few nanometers! To be able to detect this shifting, we have engineered HPF to be very stable – the optics and detector are built from special materials and mounted carefully so that they don’t cause any shifts of the spectra that could be misinterpreted as Doppler shifts. We’ve carefully thought about all the potential causes of “false” Doppler shifts, from slight thermal changes moving the diffraction grating to systematically weird ways that the light can be launched from the fiber into the spectrograph. However, this precision engineering doesn’t eliminate the “false” Doppler shifts, which are often referred to as “drifts” of the spectrograph. Even with a perfectly still, unmoving stellar spectrum shining into the telescope, we would still observe the spectrum moving in position by a few nanometers on the detector. These drifts may be attributable to any number of physical causes, from mechanical relaxation of optical components to slight differences in the weight distribution of the optical bench when we fill up HPF with liquid nitrogen coolant every day. No matter the cause, these drifts must be corrected if we hope to detect the true ~1 meter per second signals from habitable zone planets orbiting M dwarfs. We go about correcting the measurements by measuring the spectra of two sources at once: one being the star of interest, and the other being a calibration source that is known to stay as still as possible. Any measured drifts of the calibration spectrum should be entirely due to “false” Doppler shifts. We can then subtract these from the measured shifts of the stellar spectrum, which contains both the “true” Doppler shift of the stellar spectrum as well as the drift. This isolates the “true” Doppler shift of the star (or more precisely, the relative motion between the star and the Earth). What types of spectra can we use for this calibration? An ideal calibration spectrum should have spectral lines throughout the region we are measuring, and those lines should be as stable as possible. The lines should also be roughly uniform in brightness, because we don’t want the detector to be blinded by one spectral line that is much brighter than the others. Historically, the main option available for such calibration has been atomic emission lamps. These lamps are filled with certain well-characterized element mixtures (such as Thorium + Argon), and when an electrical current is passed through this mixture, it emits light at wavelengths corresponding to the energy levels of the atoms. Unfortunately, the wavelengths of these lines can change over time as the lamps age (the composition or pressure within the lamp can change slightly), and the lines are neither regularly positioned nor of equivalent brightness (see bottom panel of figure below). An example comparison of calibration spectra for astronomical spectrographs. Far better is the new generation of calibration sources, called laser frequency combs (LFCs), or “astro-combs.” These sources produce spectra with emission lines that are evenly spaced, roughly of uniform brightness, and stable in their positions. These properties result from the physical mechanisms that generate the comb, and there are several different pathways for generating the comb. The schematic of the HPF Astro-Comb. HPF is outfitted with a laser frequency comb developed by our team members at NIST. This one-of-a-kind comb was developed in parallel with the spectrograph itself, and is really an instrument unto itself! As shown in today’s other post, the combination of the HPF spectrograph and astro-comb unlocks the full potential of the instrument. The HPF comb uses the so-called “electro-optic” technique. It is based on a single continuous-wave laser (at one wavelength/frequency, in this case approximately 1064 nanometers or 282 terahertz). A set of modulators blink the laser on and off, and also shift the phase of the laser wave back and forth. The effect of this is that the calibration spectrum goes from being one wavelength to being a comb of many wavelengths (i.e. the modulation generates “sidebands”). The separation between these lines is equivalent to the rate of the modulation, and the main requirement on this is that it has to be sufficient that we can resolve the comb lines with HPF. This means that the HPF comb modulators have to operate at 30 GHz (they swing back and forth 30 billion times each second), an impressive feat! The full spectrum then spans the HPF range, and it is important to note that the whole system is connected to an atomic clock. This means that the various components are able to operate with knowledge of precisely how the best clocks in the world are ticking – so it knows and can control precisely the wavelengths (or frequencies) of all the comb lines. So not only do we have comb lines over the full HPF spectral range, but they are also completely stable! 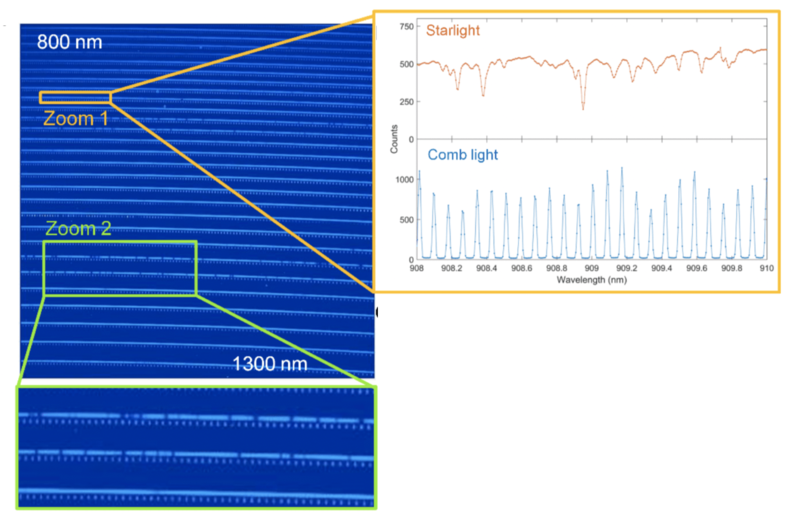 The spectral profile of the HPF comb. However, this comb spectrum is very bright near its central wavelength around 1064 nanometers, and much fainter towards 820 and 1300 nanometers. So the final step is that we need to make sure that the comb lines are all roughly the same brightness. We use a combination of a static filter and an active liquid-crystal-display-type filter (actually a mini-spectrograph!) to make the brightness of the comb lines as equal as possible. As you can tell from this description, this system has many interlocking parts, and it is one of the most advanced astro-combs yet demonstrated. Photos from the installation of the HPF astro comb. The HPF comb was installed in February of 2018, and underwent some engineering upgrades in April and May of 2018. A few photos of the deployment are shown above. The comb has been running smoothly since May, and the impressive measurements it has enabled are detailed in an accompanying blog post (see for example the simultaneous stellar and astro-comb spectra from HPF below). Our recent paper also describes the performance of this system in much more detail. 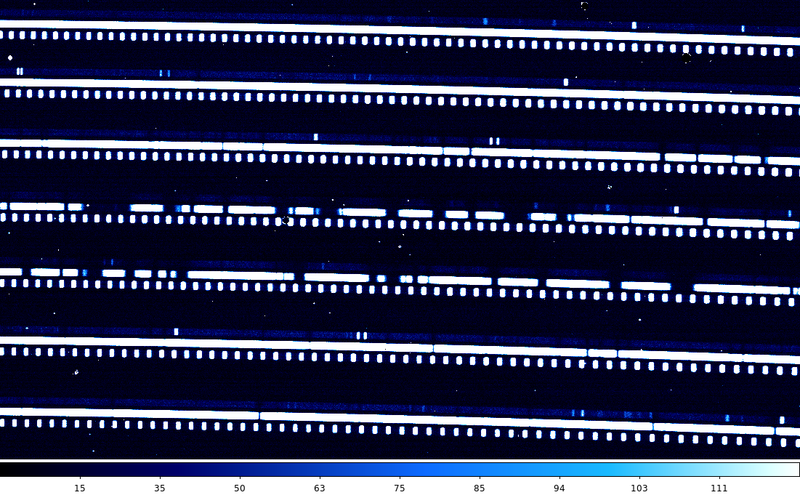 Side-by-side spectra of a star and the HPF astro-comb. The HPF team poses in front of the instrument after a successful delivery to HET. Things have been quiet here on the HPF blog for the last few months, but that has certainly not been the case in our lab! Our team has been working diligently, making the final push to deliver HPF to HET and commission the instrument. In this post, we are excited to announce that HPF has been installed at HET, and is now acquiring spectra on sky! Here are some highlights from delivery and commissioning. Once we had the instrument placed in the basement, we opened the vacuum chamber to verify that the optics had made the trip intact. While we could only admit a few team members for this task, rest assured that everyone else was nervously pacing the floor just outside! Once the instrument was placed safely in its permanent home, the team spent approximately three weeks connecting and testing the various subsystems. These subsystems include the environment control system, the fiber optic feed, the calibration suite, and the near-infrared detector, which we have detailed in previous posts here. Of course, the new wrinkle this time is that HPF is now attached to an actual telescope! Ensuring the whole system operated properly required sending a few brave team members above the primary mirror on a lift. Outfitted with the proper personal protective equipment, HPF team members Chad Bender, Suvrath Mahadevan, and Sam Halverson accompanied HET Mechanical Engineer Emily Mrozinski to the telescope’s prime focus structure. To put a long story short, HPF is now happy and healthy in the HET basement, and it is now time to get some spectra. HPF’s first-light spectrum of GJ 3470. Each set of three lines is a spectral order–a small section of the full spectrum–with the star’s spectrum in the middle, the spectrum of the night sky above it, and our wavelength calibration source below. During first light observations on the night of Nov 29th: telescope operator Emily Bevins and resident astronomer Steve Odewahn hard at work to ensure HPF records high-quality spectra ! 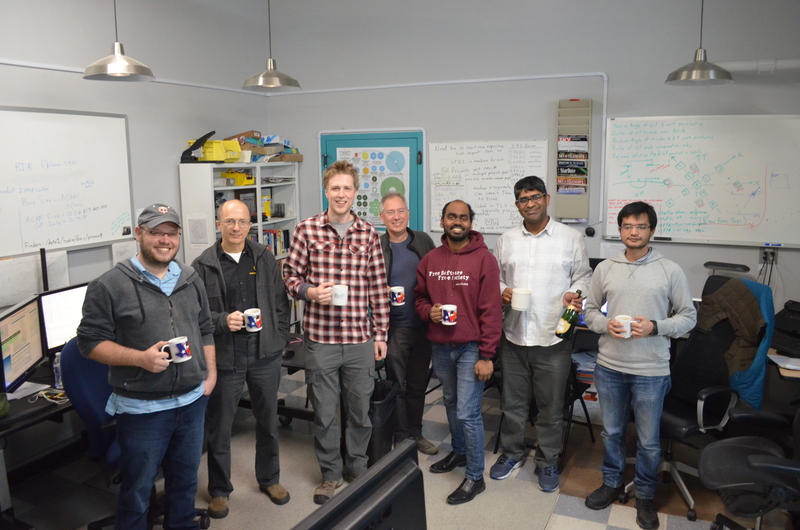 The following day, a subsection of the HPF team celebrated first light at the HET control room, alongside HET telescope operator Justen Pautzke, resident astronomer Sergey Rostopchin, Professor Gary Hill—and senior research scientist Phillip MacQueen who gladly took the photo for us ! 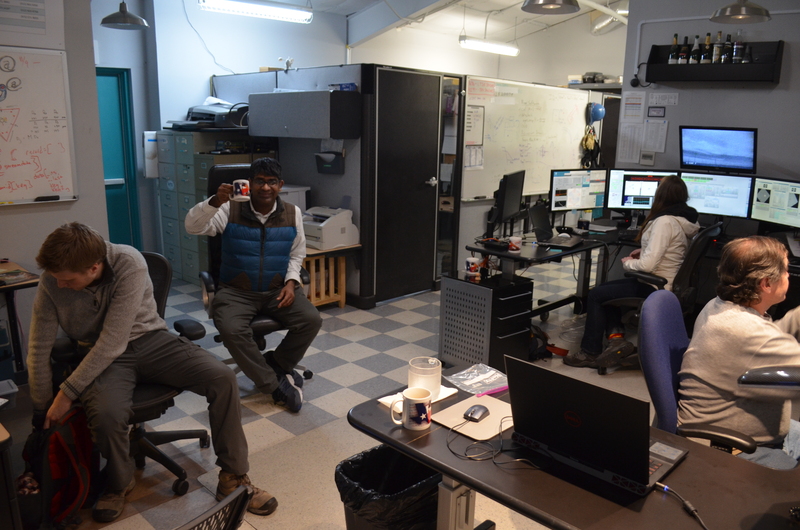 Celebrating first light at the Hobby-Eberly Telescope control room! HPF’s science commissioning has just started, and we will provide more updates as we fully characterize the system’s performance. For now, though, it is an exciting milestone to get starlight on the detector. With tantalizing new exoplanets being discovered all the time, and TESS just around the corner, it is a good time to be on sky!